The recent Changin Scotland weekend highlights the fact that the radical left can, and must, go further than simply speaking to itself in order to help create a more democratic, equal and less institutionally-dominated Scotland. Something is wrong with politics. The way it is undertaken, imagined and commented on are in deep crisis. This contributes to the many crises of what passes for British democracy and undermines any possible alternatives. In today’s Britain, provocateur Russell Brand is seen as a major public figure becoming celebrity guest editor of the ‘New Statesman’ where he called for ‘a change in consciousness’ and in a subsequent interview with Jeremy Paxman on BBC ‘Newsnight’, a ‘revolution’. Brand and Paxman were united in the disdain for the mainstream parties and political system, the former stating he had never voted, while Paxman revealed that he hadn’t taken part in recent local elections, finding all the parties ‘unappetising’. Following this Lib Dem leader Nick Clegg condemned Paxman claiming that he ‘lives off politics and … spends all his time sneering at politics’. This is what passes for serious political debate in mainstream circles in Britain, as it lurches from crisis to scandal of establishment elites: bankers, police, political classes and media. Meanwhile, real issues such as Grangemouth and the sustainability of British shipbuilding from Govan to Portsmouth, get scant or episodic attention. There is a proprietorial ownership from the political classes believing that politics is solely about what they do; and that all else – campaigning, activism, media and the politics of economic and social power – somehow is not political. There is also on those who desire to change this, the forces of the left and radical opinion, something limiting about how politics is seen and done. It is obvious in the celebration of Russell Brand as the new hero of the hour, or the sudden elevation of the new wunderkid of the left, Owen Jones, that there is a paucity of talent in the emerging generation and in ideas. But much more is at work. The way the left has traditionally done politics has contributed to the malaise it currently finds itself in. There is an entitlement culture, of thinking it has a monopoly on a number of issues, that complex issues such as equality don’t require careful analysis, combined with a tribalism and culture of ‘them’ and ‘us’. The dominant cultures of the left in the West, the UK and Scotland has been one of retreat, of political activism focusing on defending previous once thought irreversible gains, and the rituals of leafleting, demos, protests and reciting the same old tired mantras. Most of these latter activities never radicalise or politicise the unconverted; instead they are about speaking to ourselves. Politics whether on the left or generally in the UK has increasingly become a minority pastime for the articulate, affluent and organised. The same is true of Scotland. Devolution and the independence debate haven’t altered these fundamentals. The combined membership of all the political parties does not amount to the home crowd of Glasgow Rangers FC now playing in the lower leagues. One week ago, the New York based Centre for Artistic Activism (CAA) led by Prof. Stephen Duncombe and Prof. Steve Lambert came to lead a Changin Scotland weekend (run by myself and Jean Urquhart, independent MSP) in the beautiful surroundings of Newbattle Abbey College just south of Edinburgh. The audience was varied, mixed in terms of backgrounds and filled with lots of young people and women. 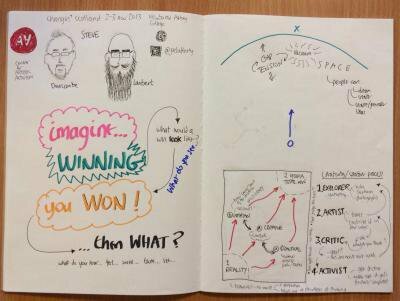 'Imagining a win', Flickr/Joe Lafferty Duncombe has previously written a short, accessible book, ‘Dream: Re-imagining Progressive Politics in an Age of Fantasy’, which argued that popular culture had to be understood and embraced. The examples he drew from were far and wide: from ‘Grand Theft Auto’ to the Zapatista guerilla army in Mexico. The message was simple and relevant to Scotland: radicals need to do a different politics, one informed by fun, play, irreverence and imagination; and less about being dogmatic, hectoring and telling people off – which all spring from a mixture of self-certainty and self-doubt. What the CAA invite people to do is ‘imagine winning’ on an issue close to their heart. They encourage people to tap into their deepest dreams and hopes and picture the world in such an eventuality. Once people are in this place they tell them ‘you have won’; the next question is ‘and now what?’ This is the part where many struggle. The point is that this exposes the limits of the utopian imagination, and that intrinsic in much of what passes for left and radical politics is a desire for the end of politics, and the pressures and burdens of being an activist. Central to all this is the power of dreaming in building real lasting social change: a point understood from Martin Luther King to the Nazis. It is also one grasped by modern advertising and game makers such as those of ‘Grand Theft Auto’. Duncombe makes the distinction between the utopian imagination and using it as a journey and conceiving of it as an ultimate destination: the latter one where the first act is working out who doesn’t belong in your supposedly perfect society and which ends in disaster and nightmare. Their reading of the Scottish situation was interesting. At first, they assumed that everyone on the left and progressive would be for independence, but quickly they grasped the nuances of the situation. Still they found it difficult to understand the conservatism of Scottish Labour and its intense hatred for the SNP. Even more they could not imagine anyone seriously believing a progressive British future would work out under a UK Labour Government: the latter being a widely held sentiment outside of the Labour bunker north of the border. Surprisingly, what caused the most heated debate was an episode of the BBC Scotland sit-com, ‘Still Game’, which was shown because the CAA guys wanted to explore the reactions people have to popular culture and entertainment. Most people enjoyed it and laughed, but many had deliberately never seen an episode, and a very small group found it objectionable and a caricature of working class Scotland. Some found it brought up serious issues about representation and the Scotland that is presented back to audiences by broadcasters, concerns over cultural power and commissioning, and could not enjoy it for those reasons. Other insights included the secret languages and codes which fill much of professional and political life: from the acronyms of SCVO, STUC and COSLA to what happened at UCS forty years ago with Jimmy Reid and Jimmy Airlie. One participant suggested that in the future, people should all be given red cards which they can put up when speakers at public events descend into incomprehsible jargon and phrases. What would a Different Scotland Look Like? The Changin Scotland weekend witnessed a very different kind of experience. In a public culture which is still very male dominated and filled with male only spaces, more than half the people who spoke were women, which when it happens shows that equality feels natural. Then there is the importance of creating and maintaining non-partisan spaces where people can talk and listen without the binary, tribal assumptions, something Changin Scotland has worked to maintain since its inception in November 2002. Then there was the appeal of the Centre for Artistic Activism presenters, Stephen Duncombe and Steve Lambert, with their beards, enthusiasms, insights from the US about Martin Luther King, how Rosa Parks wasn’t a lone individual, but a trained National Association for the Advancement of Coloured People (NAACP) activist, and their curiosity and enquiry about Scotland, the Scottish left and independence debate. All of this provides some revealing insights into the state of the Scottish debate. The importance of fun, play and imagination has to be more widely recognised. More profoundly, we have to kick against the limits of our democracy and the constrained, controlled spaces of public life; not all the shortcomings of this are due to external factors or British politics as ‘the missing million’ voters from Scottish politics illustrates. Instead, we have to set our sights on a more idealistic, far-reaching political and cultural activism which isn’t about the safety first, cautious approaches which dominate politics and the referendum. We have to dare to dream more, and map out the destination of a different Scotland, more democratic, equal and less institutionally dominated. In the process, whatever the result next year, we will contribute to changing Scotland, and get us nearer to that destination. There are a whole range of welcome left and radical activities which have emerged thanks to the independence debate from the Radical Independence Campaign (RIC), to the Jimmy Reid Foundation and National Collective to name but a few. In their aspirations for a different Scotland – of transcending the inequities of Anglo-American capitalism and becoming more social democratic and more Nordic – pro-independence and self-government forces have to elucidate what kind of ultimate society this would like. What would a Nordic Scotland actually look like? What would a society of the Commonweal involve? Leaving aside the feasibilities and trade-offs involved. Asking these questions would begin to marshal and mobilise the radicalism and idealism which has emerged as the result of Scotland’s constitutional debate. It is time to learn the lessons of the limits of the left, how it does politics, and stop speaking, talking and protesting to ourselves. There are higher stakes to play for now. What is The School for Creative Activism? from Steve Lambert on Vimeo.